Precedent: Previous ruling by a presiding officer that becomes part of the procedures of a chamber. 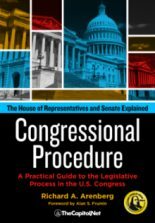 Each chamber of Congress follows laws, rules, precedents, and practices that apply in its chamber. Each chamber is very different. The strategies that work in the House, a majoritarian institution, are different from those that work in the Senate, an institution where the individual senator reigns supreme. This volume, commonly referred to as House Practice, was compiled by Parliamentarian Emeritus of the House William Holmes Brown, and updated by the House parliamentarian to be current through the 115th Congress. House Practice summarizes the most common procedures used by the House and explains their usage in lay language. It was updated in 2011 and 2017. The book is organized alphabetically by topic and cites other parliamentary reference sources. It is thoroughly indexed and available online at Govinfo.gov. The Precedents of the U.S. House of Representatives is a combination of three different documents: Hinds’ Precedents, Cannon’s Precedents and Deschlers’s Precedents. The parliamentarian compiles the precedents of the House. 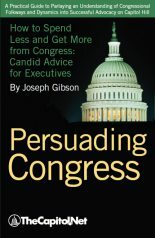 In addition to House Rule X, precedents and agreements affect committee referral decisions. In general, these precedents dictate that once a measure has been referred to a given committee, the measure’s subject matter remains the responsibility of that committee. The precedents further presume that amendments to laws that originated in a committee are within the purview of that committee as well. House Rule XVI, clause 7, governing germaneness, is one of the most discussed rules of the House and thousands of precedents have resulted from its interpretation or application. Over 2,000 pages of precedents in Hinds and Cannon, Deschler’s Precedents, and the parliamentarian’s annotations in the House Rules Manual address germaneness. Over the years, both chambers have developed an extensive set of rules (some set forth in statute) and precedents that lay out complicated, multiple processes for making budgetary decisions. For example, under House precedents, a continuing appropriations measure is not considered to be a general appropriations bill, and it may thus fund unauthorized programs. This multivolume series provides an historical overview of House precedents during the period 1789 to 1936. Volumes 1 through 5 are known as Hinds’ Precedents and volumes 6 through 11 are known as Cannon’s Precedents. (Collectively, they are referred to as Hinds’ and Cannon’s Precedents.) Asher C. Hinds was a Republican representative from Maine from 1911 to 1917, and Clarence Cannon was a Democratic representative from Missouri from 1923 to 1964 and a parliamentarian of the House from 1915 to 1920. Asher C. Hinds, Clerk at the Speaker’s Table of the House from 1895-1911, compiled the early precedents of the House, dating from the First Congress. These materials were prepared and published by authority of the Act of Congress, approved March 4, 1907. Hinds’ Precedents is a 5-volume series containing selected rulings made by the chair. The publication provides valuable coverage of the historical origins and evolution of House procedures dating back to 1789. The precedents are numbered sequentially throughout the volumes. Hinds’ Precedents are available online through FDsys and Govinfo.gov. Clarence Cannon, Clerk at the Speaker’s Table of the House 1917-1921, compiled the precedents of the House dating from 1908-1936 (60th-74th Congresses). These documents are the second half of an eleven-volume series containing selected rulings made by the Chair between 1789 and 1936, with the first have being Hinds’ Precedents. Cannon’s Precedents was published in 1936. The precedents are numbered sequentially throughout the volumes. Cannon’s Precedents are available online through FDsys and Govinfo.gov. 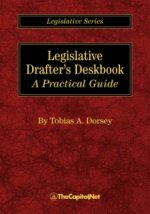 This single-volume document, referred to as Deschler’s Procedure (after former House Parliamentarian Lewis Deschler), presents selected precedents from 1959 through 1980. A 1985 supplement covers 1981 through 1984, and a 1987 supplement covers precedents created from 1981 through 1986. House Practice, described above, was designed to replace Deschler’s Procedure. This document is arranged around topics of procedure, with each chapter divided into broad subtopics. As such, a knowledge of procedure is helpful in navigating the publication. Deschler’s Procedure is out of print. 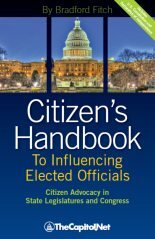 Copies are available for reference at the House Legislative Resource Center, B-106 Cannon House Office Building. This multivolume series contains precedents from 1936 to the recent past. Additional volumes are being prepared by the office of the parliamentarian. 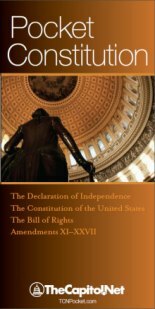 The first nine volumes are called Deschler’s Precedents of the U.S. House of Representatives; the volumes thereafter, numbered 10 to 16 as of 2007, are referred to as Deschler-Brown Precedents, to acknowledge the work of former Parliamentarian William Holmes Brown. Additional volumes are anticipated. The books are organized by topical chapter parallel to those in Deschler’s Procedure. 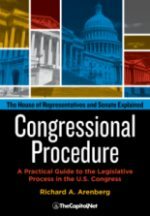 For many of the topics, the full text of discussion creating or interpreting precedent on the House floor is provided, as well as the page citation from the Congressional Record. Some of these volumes are out of print. Copies are available for reference at the House Legislative Resource Center, B-106 Cannon House Office Building, and available online at Govinfo.gov.